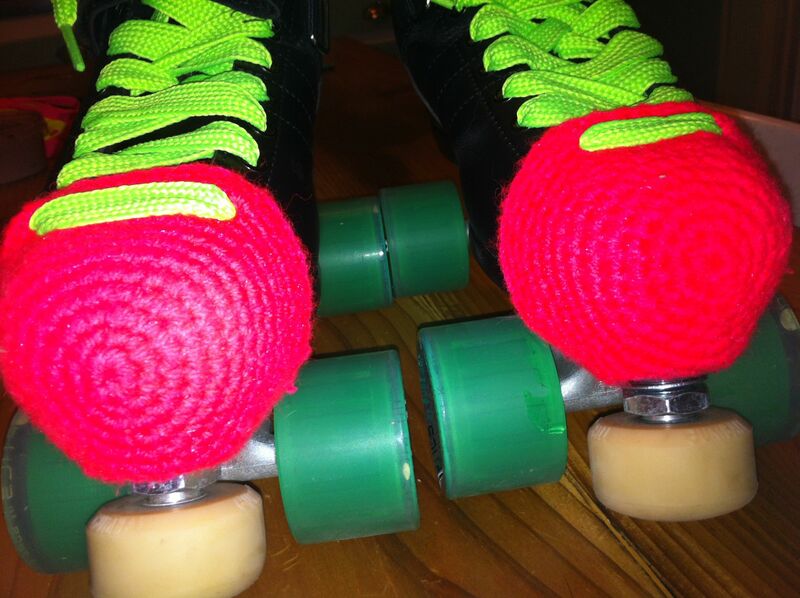 THESE BRILLIANT ROLLER SKATES BELONG TO ROLLER DERBY QUEEN “VERUKA ASSAULT” SHE CROCHETED THE TOE CAPS HERSELF THE GREEN FLOURO SHOELACES COME FROM MY BACKLOGGED COLLECTION OF SHOE MAKING BLING FROM MY DAYS AS A SHOEMAKER CRAFT MEETS ROLLER DERBY IN THE ADELAIDE SKATING SCENE. 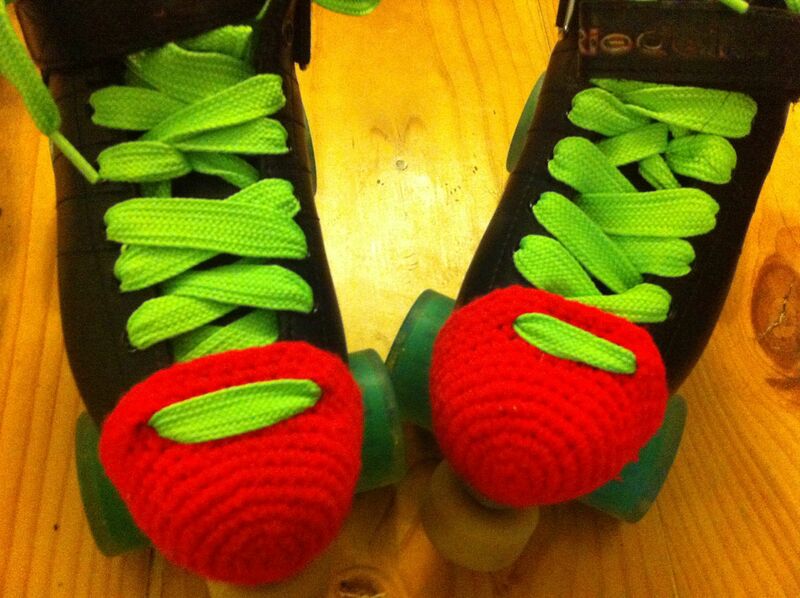 ANOTHER PLAYER MADE HERSELF SOME HAND FELTED TOE CAPS. 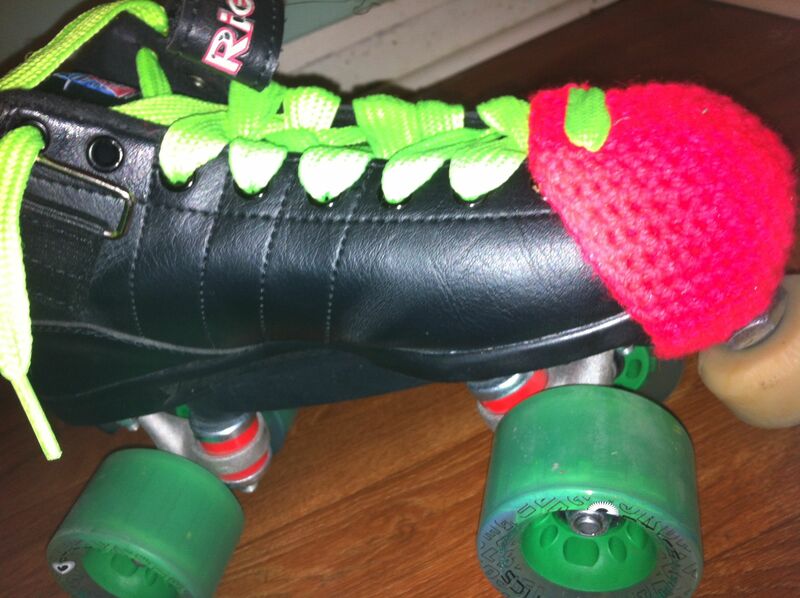 This entry was posted in Uncategorized and tagged craft, crochet, photography, roller derby, roller skates, shoe laces, yarn bombing on January 31, 2013 by yarnbomb. 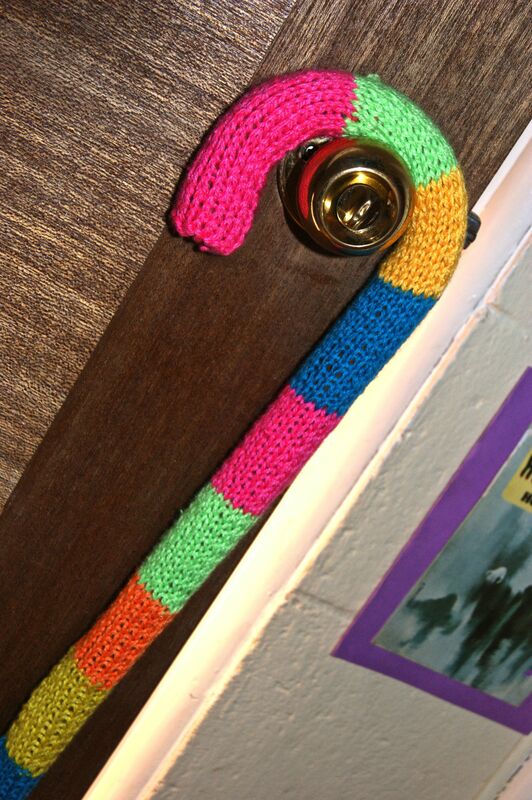 I TOOK THIS WOODEN WALKING CANE & I SEWED A PIECE OF STRIPED KNITTING AROUND IT. 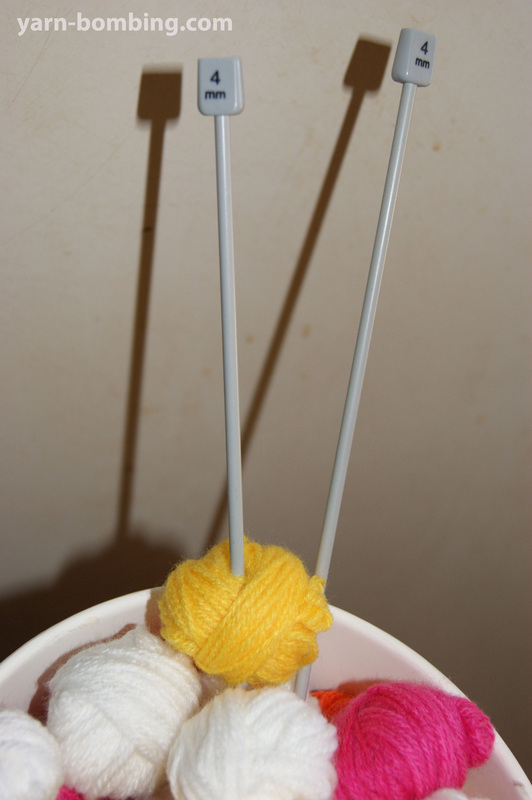 IT WAS A SIMPLE KNITTING JOB & THE CANE IS STILL USEABLE. 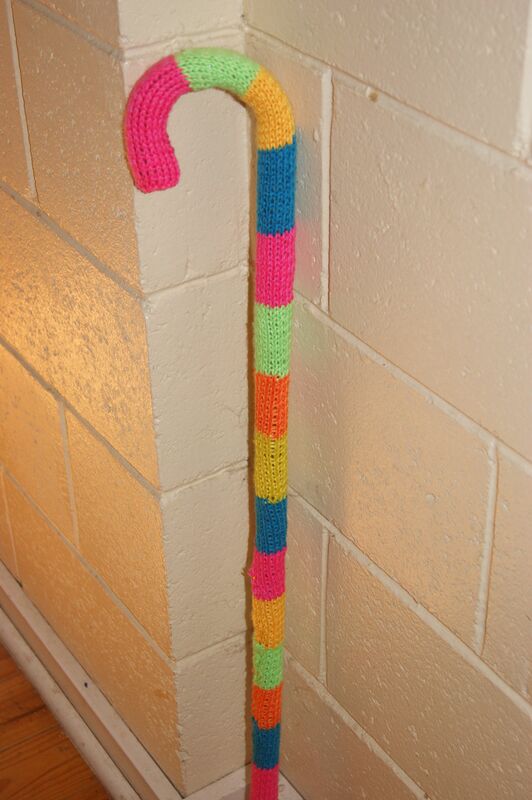 THIS CANE LOOKS A BIT LIKE A CANDY CANE & I ENJOY HAVING IT DECORATING MY CRAFT INSPIRED HOME. 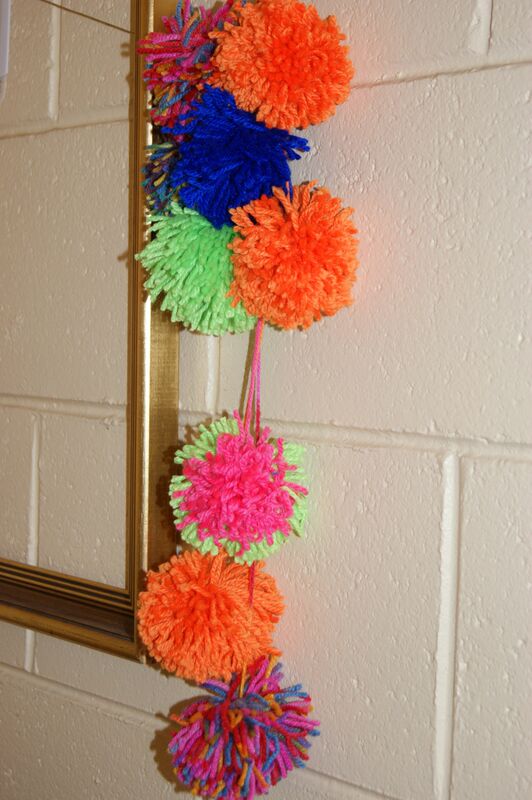 POMPOMS ARE EASY & A LOT OF FUN TO MAKE. KIDS CAN MAKE THEM & SO CAN ADULTS. 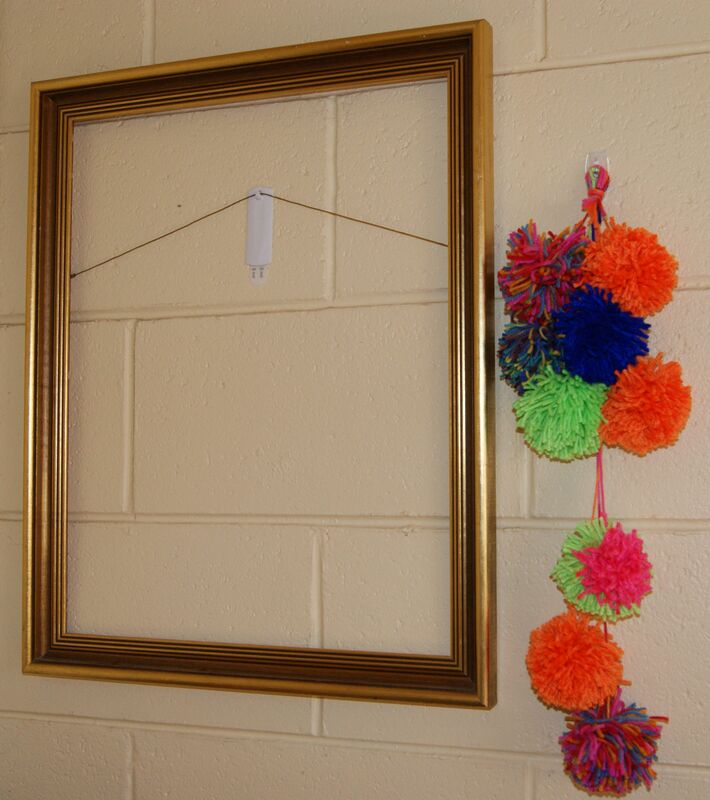 YOU CAN EITHER BUY A SIMPLE POMPOM MAKER FOR A FEW DOLLARS AT A CRAFT STORE OR YOU CAN MAKE YOUR OWN POMPOM MAKER WITH A PIECE OF ROUND CARDBOARD. 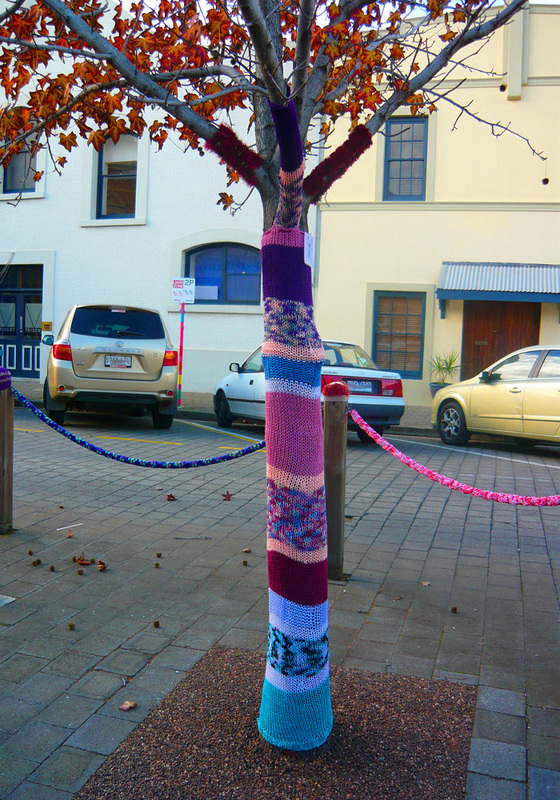 This entry was posted in Uncategorized and tagged craft, knitting, photography, POMPOM, yarn bombing on January 28, 2013 by yarnbomb. 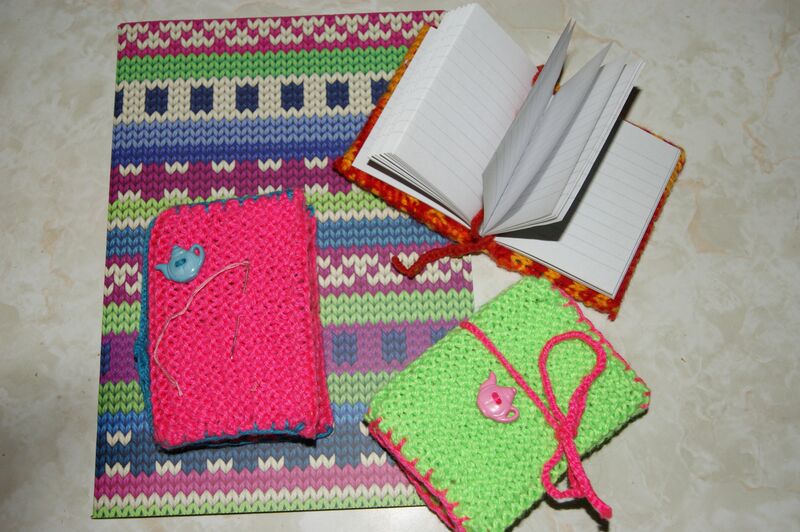 I KNITTED SOME LITTLE NOTEBOOK COVERS & THEN I FOUND THE LARGE NOTEBOOK IN A GIFT STORE & THE KNITTED DESIGN IS PRINTED ON THE COVER. 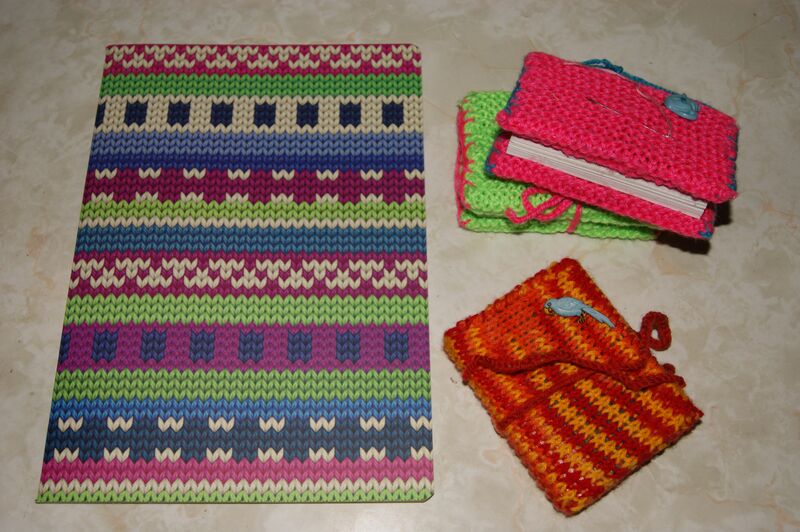 I TEND TO MAKE UP MY KNITTING PATTERNS AS I GO ALONG & IT’S ALWAYS GOOD TO WRITE DOWN THE PATTERN FOR FUTURE USE. 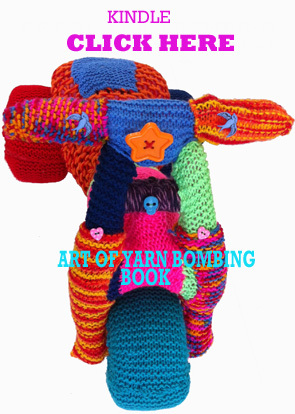 THESE BOOKS ARE GREAT FOR NOTING DOWN MY KNITTING & CROCHET PATTERNS & I EVEN STORE A SPARE SEWING NEEDLE STUCK IN THE FRONT COVER. 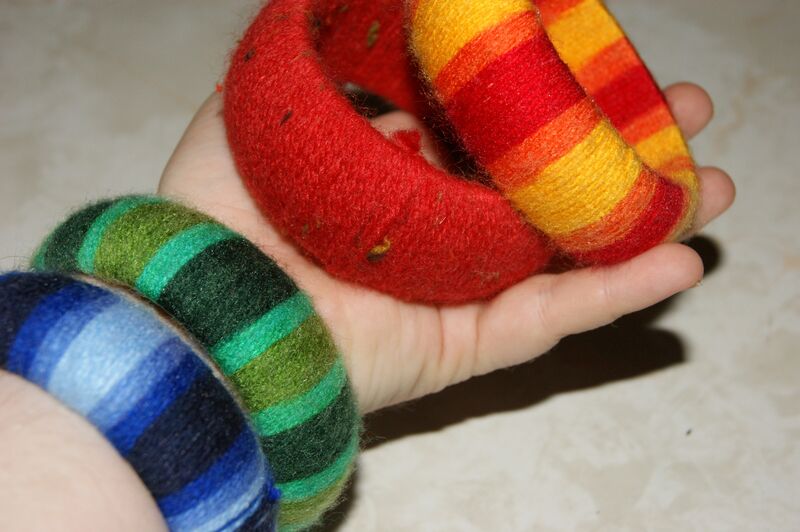 THESE YARN COVERED BANGLES ARE A FUN & FASHION FORWARD CRAFT PROJECT & THEY ARE EASY & CHEAP TO MAKE I USED WOODEN BANGLES TO MAKE THESE, BUT ANY OLD PLASTIC OR METAL BANGLE OR BRACELET COULD BE USED. 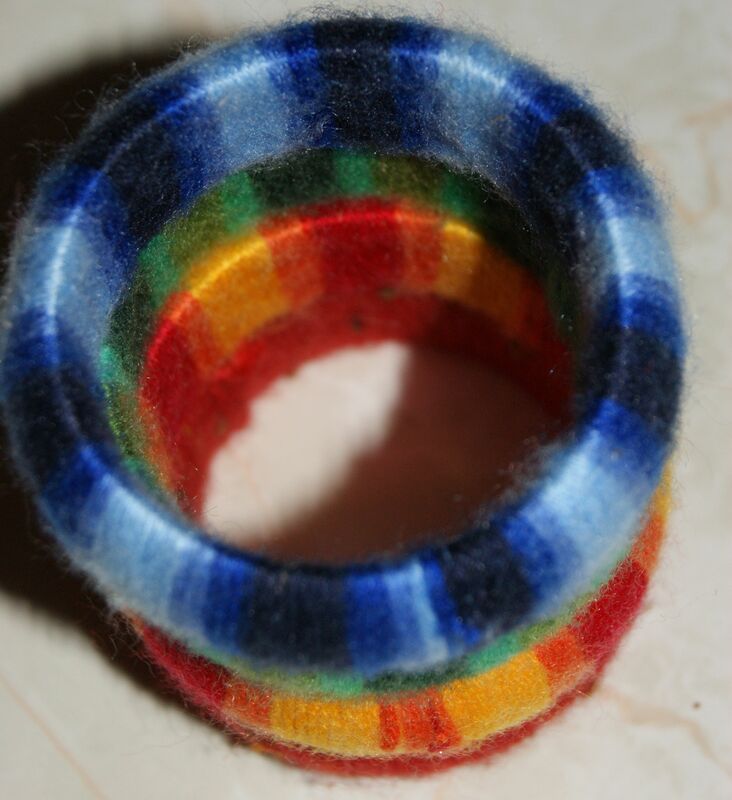 ALL I DID WAS WIND MULTI COLOURED YARN & WOOL AROUND THE BANGLES UNTIL THEY WERE COVERED & THEN I TIED THE WOOL OFF AT THE END BUT YOU COULD USE A DAB OF GLUE. 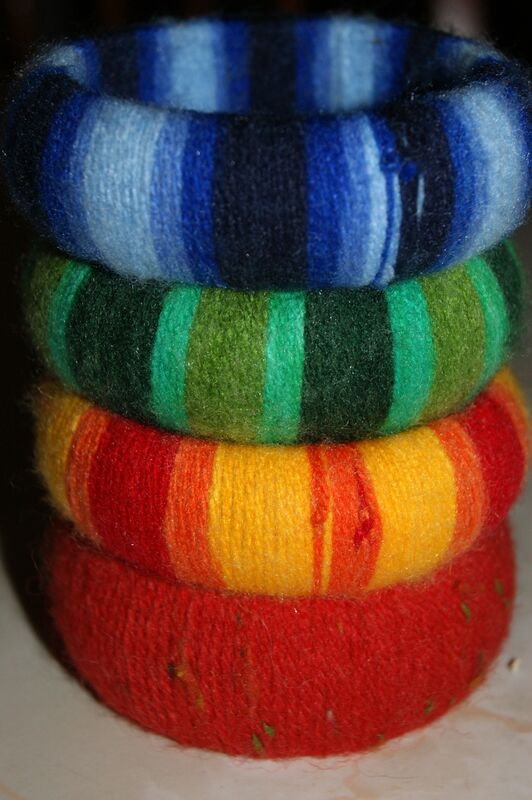 IF YOU ARE WANTING TO GET STRIPES ITS EASY. 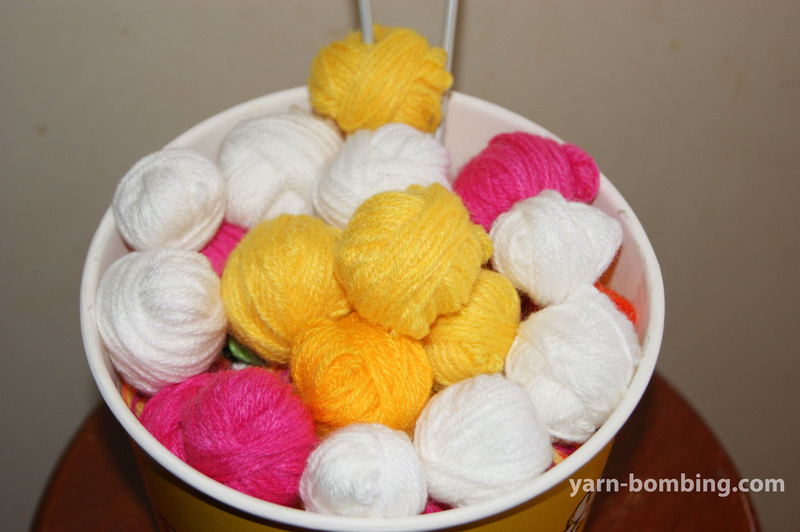 JUST BUY A MULTI COLOURED BALL OF YARN ( I BOUGHT SOME FROM KMART FOR TWO DOLLARS A BALL ) IF YOU WIND THE WOOL EVENLY AROUND THE BANGLE IT WILL FORM STRIPES ALL ON ITS OWN. 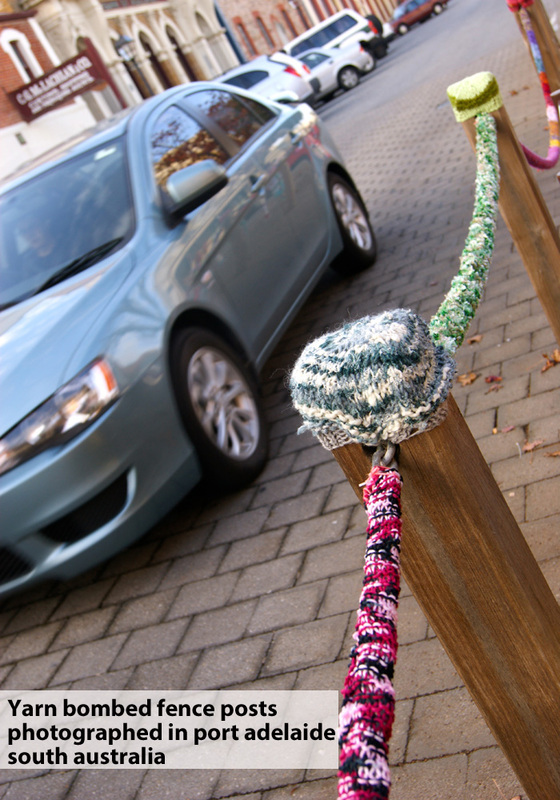 This entry was posted in Uncategorized and tagged bagle, bracelet, craft, crochet, fashion, knitting, notebook, photography, wool, yarn, yarn bombing on January 25, 2013 by yarnbomb. 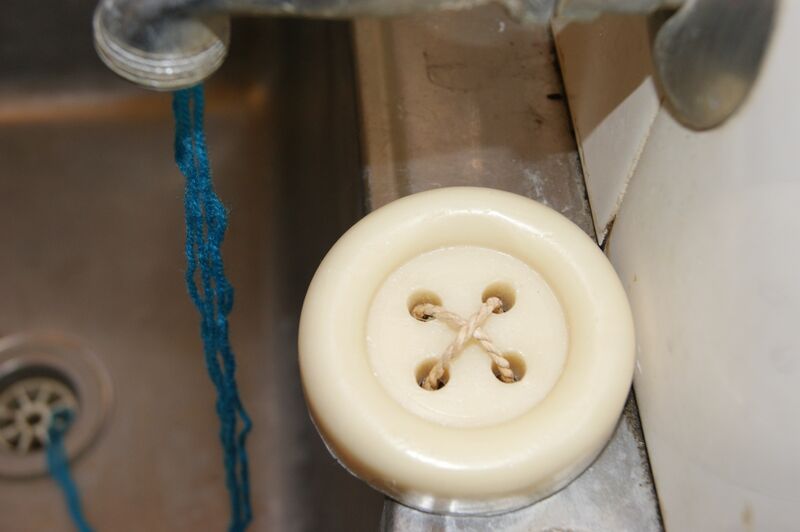 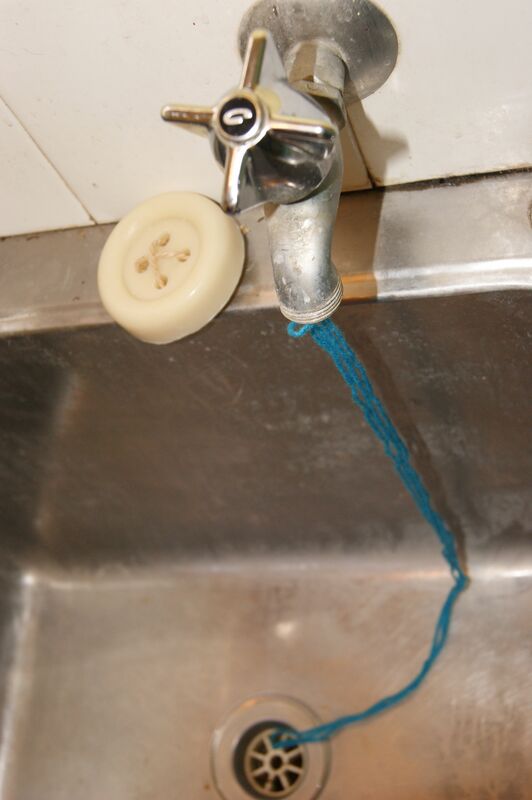 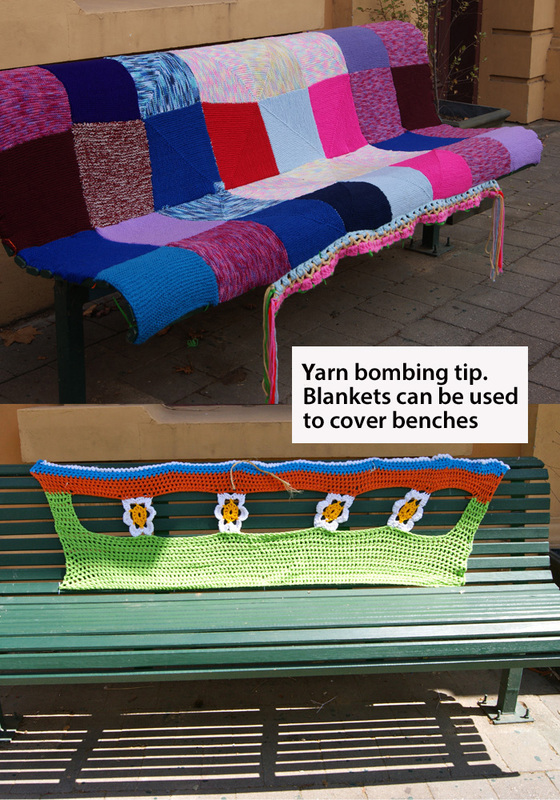 This entry was posted in Uncategorized and tagged button, laundry, photography, soap, yarn bomb, yarn bombing, yarn water on January 21, 2013 by yarnbomb. 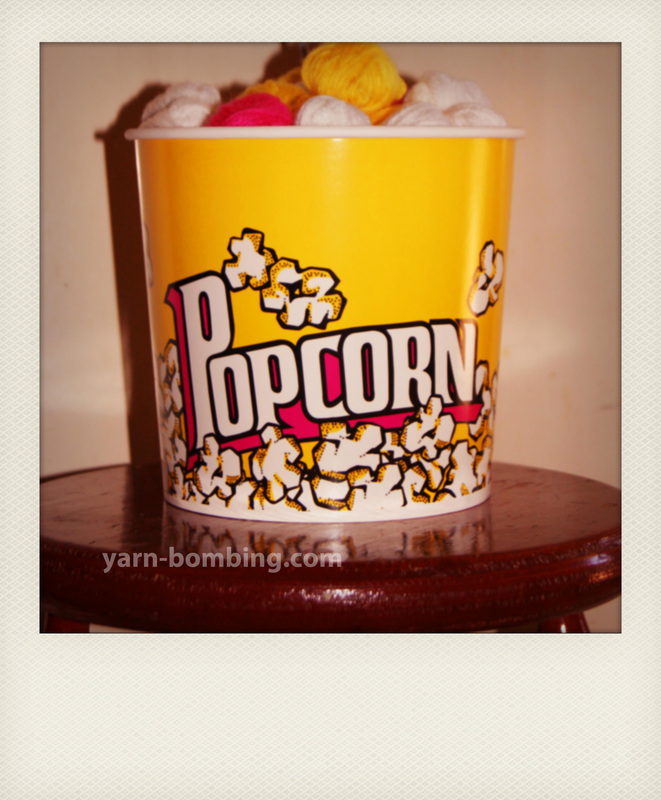 I PUT TOGETHER THIS POPCORN YARN BOMBING KIT AS A BIRTHDAY GIFT FOR A FREIND. 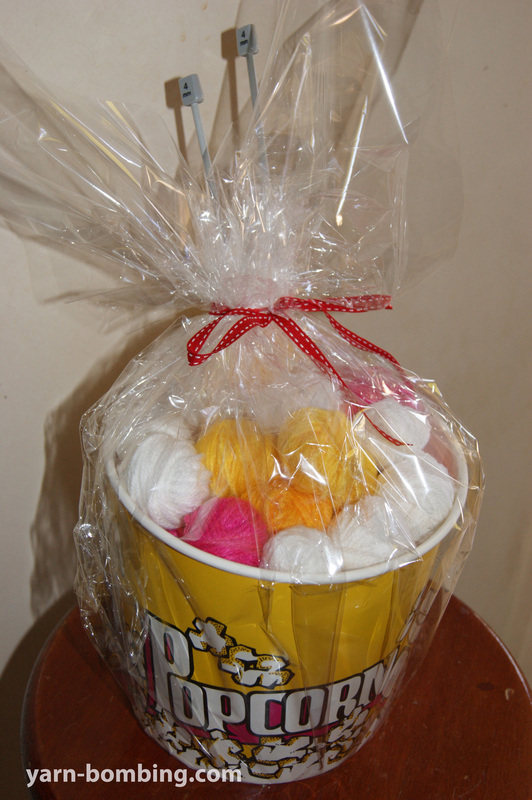 I HAND ROLLED THE LITTLE POPCORN BALLS OF WOOL & ADDED A PAIR OF KNITTING NEEDLES MY FRIEND LOVES DOING CRAFT & THIS WAS A PRACTICAL, FUN & WHIMSICAL HANDMADE GIFT THAT I COULD EASILY PUT TOGETHER MYSELF I WRAPPED IT WITH SOME CELLOPHANE & TIED IT WITH SOME SCRAP RIBBON LEFT OVER FROM A PREVIOUS CRAFT PROJECT I GOT THE POPCORN BUCKET FROM THE REJECT SHOP, BUT YOU COULD DECORATE YOUR OWN BUCKET OR RECYCLE AN OLD ONE AS LONG AS IT’S NOT GREASY FROM BUTTER RESIDUE. 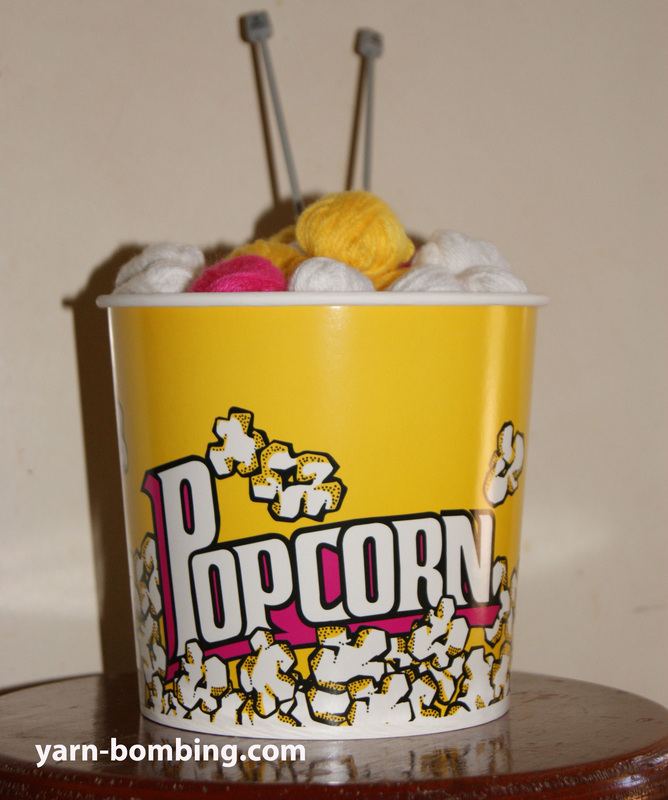 AFTER THE WOOL HAS BEEN USED THE BUCKET CAN BE RE-USED FOR A MOVIE NIGHT. This entry was posted in Uncategorized and tagged craft, gift, handmade, knitting, photography, polaroid, popcorn, yarn bombing on January 15, 2013 by yarnbomb. 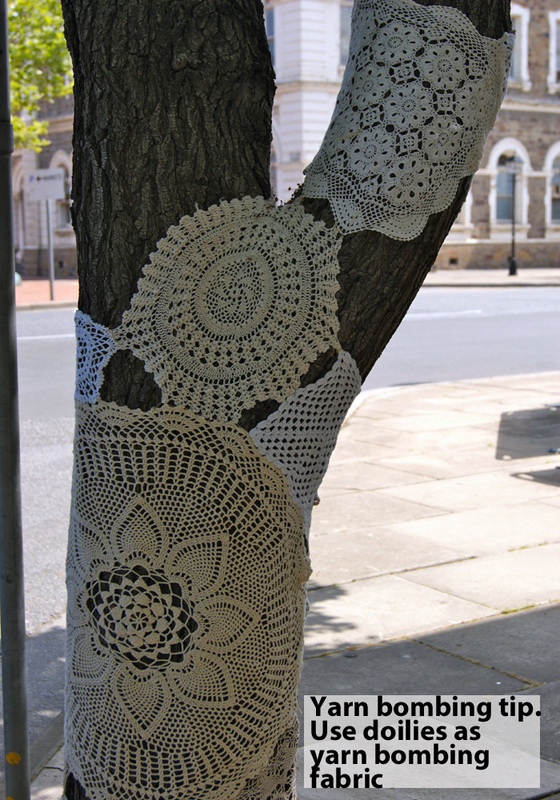 YARN BOMBED STREETS FESTOONED WITH KNITTING & CROCHET IN ARTSY LITTLE ADELAIDE, SOUTH AUSTRALIA. 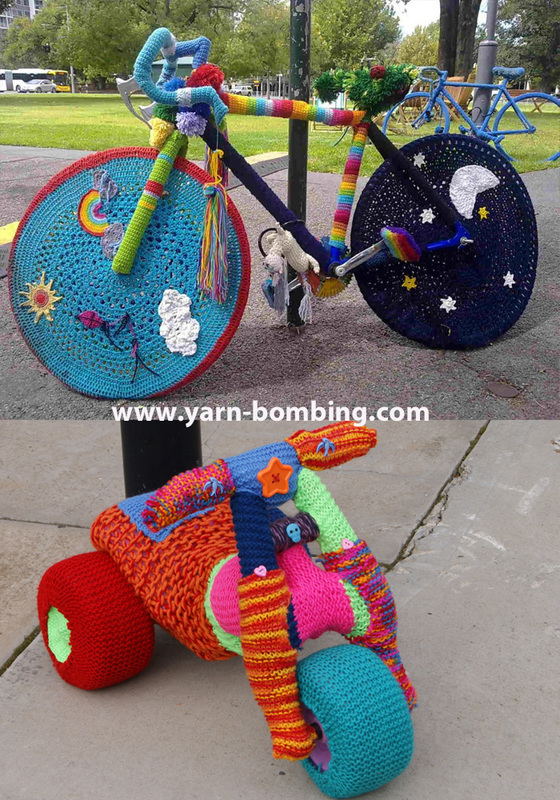 This entry was posted in Uncategorized and tagged adelaide, bikes, crochet, knitting, photography, south australia, street art, yarn bombing on January 13, 2013 by yarnbomb. 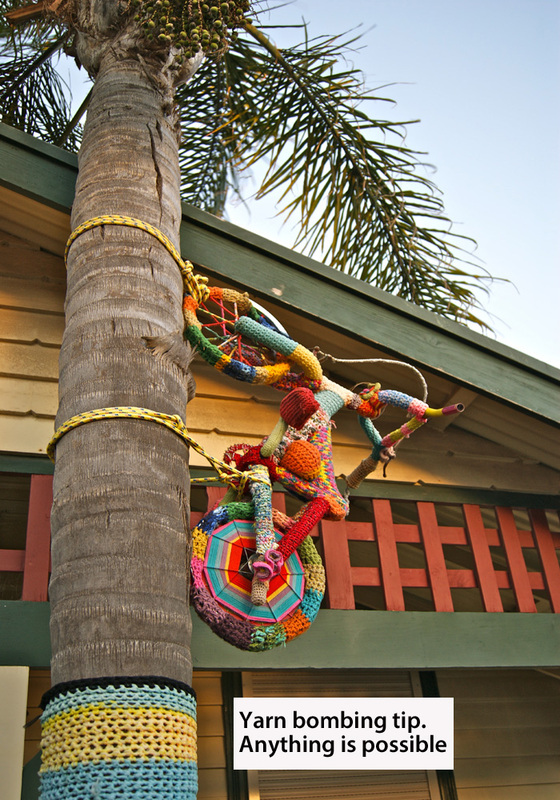 This entry was posted in Uncategorized and tagged art, bikes, craft, crochet, knitting, photography, yarn bombing on January 10, 2013 by yarnbomb.